Today we celebrate that paragon of desserts, the chocolate éclair. Part pastry, part creamy filling, part chocolate goodness, and completely delicious, the éclair—and later the chocolate version—was the brain child of French chef extraordinaire Antonin Carême in the early 1800s. Abandoned by his parents during the French Revolution, Carême went to work as a kitchen boy to survive. He became an apprentice to famous pâtissier Sylvain Bailley, and he was so talented that, after his training, he was able to move from restaurant to restaurant while gaining a name for himself and his delicacies. Enjoy the day by indulging in this very special treat. “Ahoy!” Antoine hails the caller to the control center when the red alert button lights up. He listens carefully as Betty the Panda describes the crime. “A bread bandit burgled by bakery before breakfast!” It seemed her “counters and cupboards were completely cleared of carrot cake, cornbread, and crackers. This is a considerable crummy crime,” she sums up with aptly punny indignation. Copyright Travis Nichols, 2017, courtesy of Chronicle Books. Antoine is immediately on the case, calling in his detectives from their various pursuits to “dutifully deal with [the] distressing dilemma.” When they arrive at Betty’s Bakery, she shows them the empty shelves and is assured that they will “find the fully fed, fiendish foe.” The detectives fan out across the store and are surprised that anyone could have broken in without tripping the powerful security system. Josie believes the “key to catching this kitchen crook” is in examining what they left behind—namely the “kale crumpets” and a cash register full of money. The gumshoes have been so hard at work trying to crack the case that Quentin has gone to the market next door and brought back snacks to sustain them. Everyone digs in, except Betty who’s “in need of nary a nibble.” When Morgan the chicken is finished with his snack, he inquires whether perhaps Betty didn’t hear something since she lives right above the bakery. But Betty, it seems, is a deep sleeper and heard nothing. Antoine looks around and has a quick question for Quentin about how long he thinks it would take to “acquire this quantity of baked goods.” Josie notices that the racks are so high that “no runt could ransack this room.” Meanwhile, Steve the monkey has discovered a clue. He thinks they could track the tooth marks in a tasty tart. Steve is just about to match the distinctive notch in the half-eaten cookie to one sharp tooth in a snoozing Betty’s lower jaw when…swipe!…Betty grabs the cookie and gobbles it up. The detectives look on in astonishment. “Sleepwalking?” suggests Mike the bull. “Sleep eating,” corrects Josie. Just then Betty wakes up to see all the detectives staring at her, ready to solve the case. “You yearn for sleep, yes?” asks Steve. Sharon, the duck reminds Betty that she last ate yesterday, yet she wanted no snack, and Quentin reveals, “you ate your yield of yummies yourself.” Betty’s surprised… astounded… asleep! But the Gumshoe Zoo has a bit of celebrating to do since they “zipped this zany, zigzagging zinger with zeal! The press celebrates them too with an article in the 1000% True News. But what’s this on Page 2? A valuable painting has been stolen! It seems there’s a new case for the Gumshoe Zoo to solve! Notes about alliteration and some very hungry animals follow the text. Travis Nichols’ witty alliterative alphabetic mystery will have little ones giggling at the zany language and big words that trip off the Gumshoe Zoo detectives’ tongues, while adults will laugh along and shake their head in appreciation of the clever construction of the story. Detective-story tropes, including the round-up of detectives caught in the middle of chores or play, a clueless member of the team, and the locked-room mystery, add to the fun. The panel illustrations set a quick pace for the investigation and clearly show the objects or ideas being alliteratively alluded to to boost younger readers’ understanding. Betty’s Burgled Bakery will be a favorite of little linguists-in-the-making as well as for mystery lovers. It’s a book that will be asked for again and again. 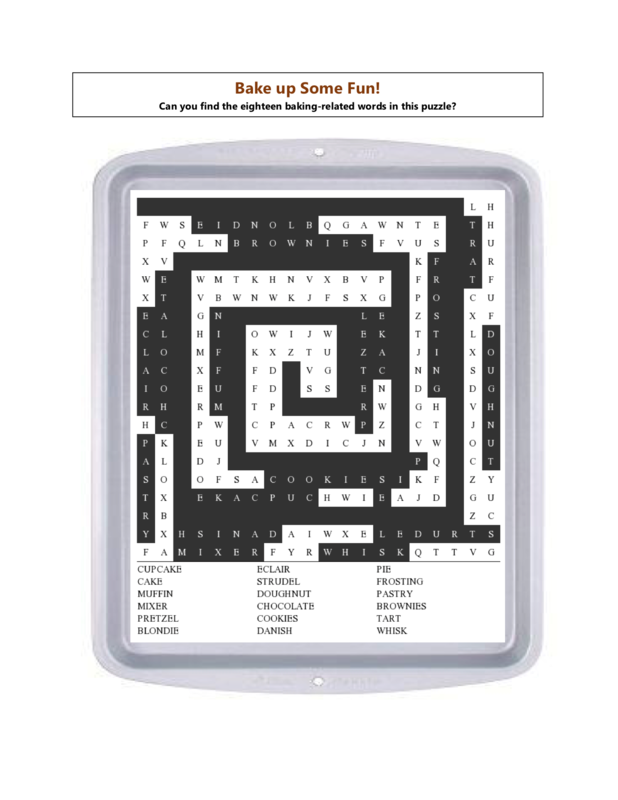 It makes a fun and unique addition to home bookshelves and a terrific English or writing lesson lead-in for classrooms. 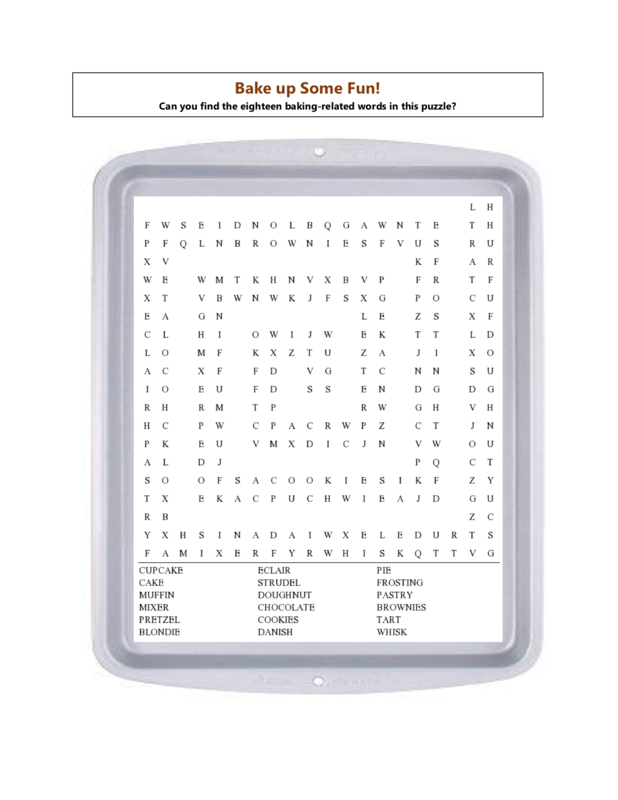 Before this pan goes into the oven, can you find the eighteen baking-related words in this printable word search puzzle?